My family holds reunions at the St. Peter’s church virtually every summer, just north of Selkirk and on the banks of the Red River in southern Manitoba. Growing up, I never knew why we did, nor cared really; the homemade pie was far more of a concern. Last summer, we held races, a candy scramble, and ended in a water fight around the underground well pump – which happily gushes as it has for generations. Just a few metres from our reunion site is Chief Peguis‘ grave. Just a few more there are headstones, with dozens of names of my relatives. On the other side remains the foundation of the old St. Peter’s Store. Not to be forgotten is the church, a powerful spiritual place that has held up well over the years. In all this beauty, you would never know what happened here in 1907. After bribing leaders and waiting until much of the community was absent, government agents visited and held a vote for removal. You see, unscrupulous Manitoban citizens and farmers desperately wanted the fertile and rich land the Cree and Anishinaabe residents of St. Peter’s had negotiated through treaty and lived on. The vote – in which anyone who voted “yes” was promised $90 and no voting record was kept – unsurprisingly passed. The following years were rife with violence as St. Peter’s residents were forcibly removed north, where Peguis First Nation now sits. Those who remained were harassed by police, forced to squat on their own territory, and subjected to ridicule when they entered town looking for work. Amazingly, and regardless of this violence, my ancestors persevered. Many eventually made homes in Selkirk. Some bought back their family homelands. The Selkirk Friendship Centre became a meeting place for all of us. In fact, that’s where I first learned of the removal. That’s because, inexplicably, I never heard about St. Peter’s in school, in town, or read about it on any monument. Surrounded by the very land in which this happened, this history was never mentioned. I grew up surrounded by the erasure and silence created by one of the most violent and unjust acts in Manitoba’s history. That is until every summer, when my family showed me the complexity of the story of St. Peter’s through laughter, food, and water fights. While I have never forgotten the painful parts, I remember far more the beautiful gifts they give me. Later, as a researcher and writer, I discovered the most amazing thing of all: this story is not unique. It continues to be, however, one that few know. Like it, there are many more. 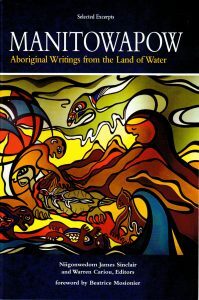 Stories of relationships, resisting violence, and resilience are everywhere; our province is filled with powerful visions and experiences told through the eyes of Aboriginal peoples. All of Manitoba should hear these stories in order to get a full understanding of all that has happened in this place; the beauty, the struggles, and everything in between. 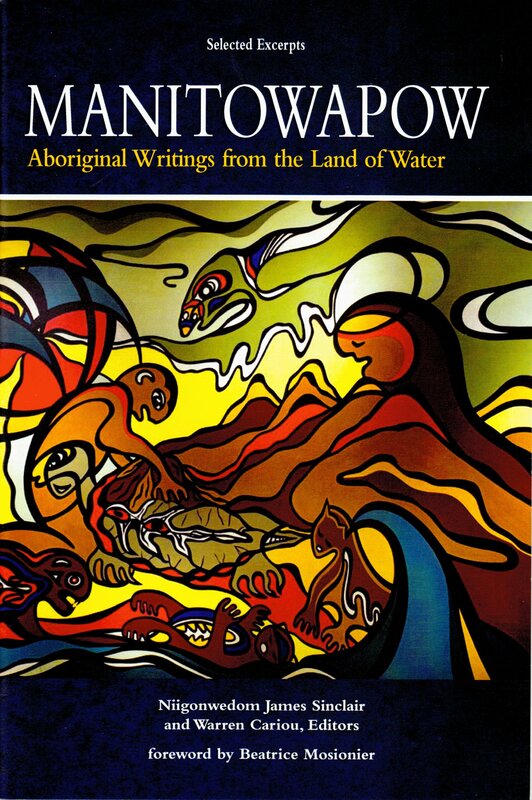 This is what my co-editor Warren Cariou and I hoped to do while assembling the anthology Manitowapow: Aboriginal Writings from the Land of Water. For a sample piece of the anthology, click here. Note: Manitowapow or “the narrows of the Great Spirit” is the original Saulteaux and Cree name for the lands and waters in and around what is now known as Manitoba . This name honours the sacred sounds when waves hit the loose surface rocks on the north shore in the narrows of Lake Manitoba – sounds that traditional peoples believed came from the drum beats by Gichi Manitou (The Great Spirit).